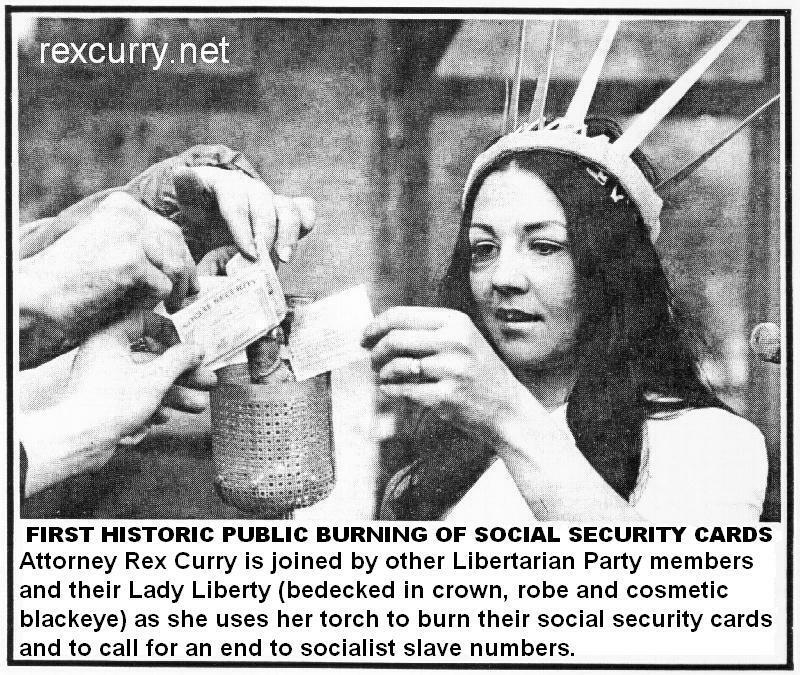 SOCIAL SECURITY CARD NUMBERS are burned because of RexCurry.net ?!?! 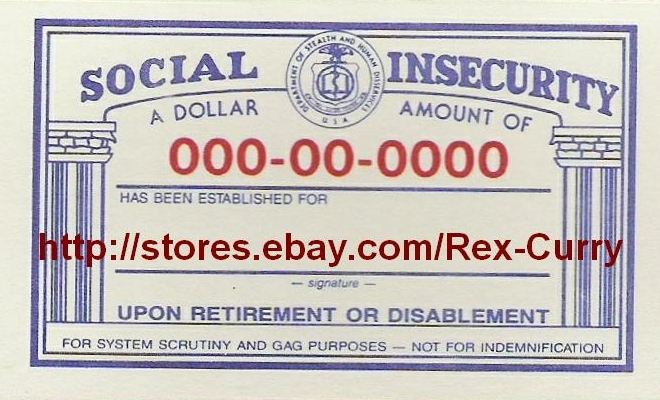 Card image was posted on wikipedia article entitled "Social Security number". On Saturday, November 12, Free State activists from Keene and as far away as New London Connecticut gathered to defy national identification systems. 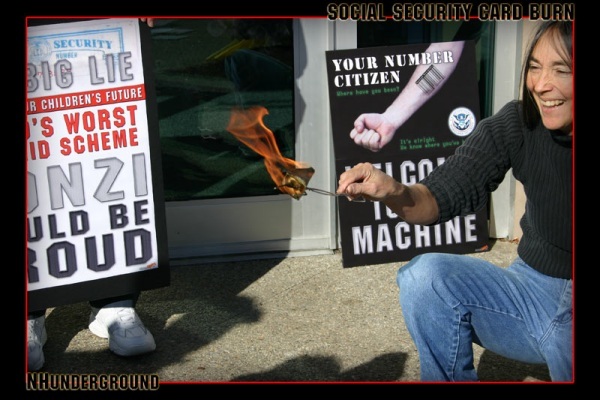 In full view of the social security administration, social security cards were burned, sending a message that national ID will not be accepted. Around twenty activists gathered to take part in the torching festivities. 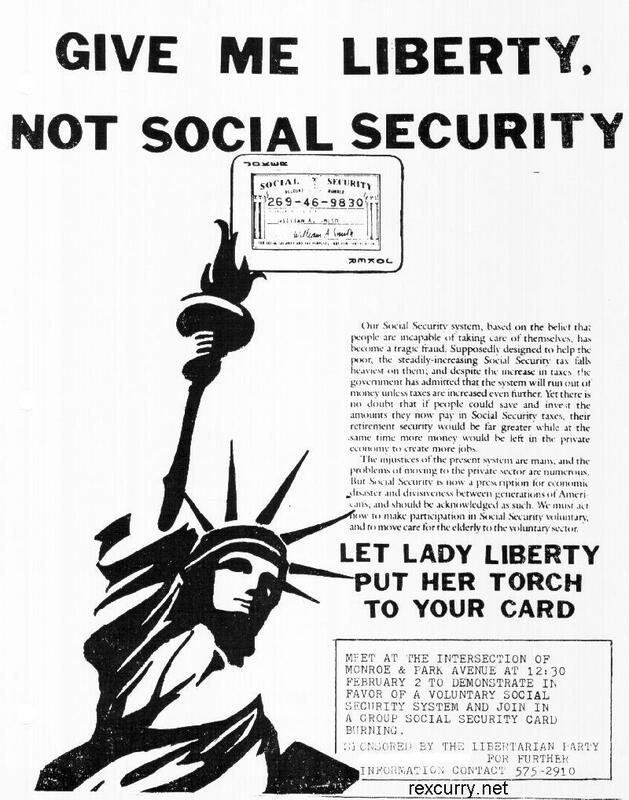 When Social Security was first foisted on America, the cards were imprinted with, "Not to be used for Identification." People were wary of the tyranny involved with a national ID card, so the government had to promise that the Social Security number would never be used for ID. They have broken that promise. As Americans became resigned to the idea of having a national number, the promise was quietly removed from the cards. Now, of course, the social security number is used for so many purposes, it is a defacto national ID number. Doctors, banks, motor vehicle departments, utilities companies…the list is endless of groups wanting your national ID number, groups having nothing to do with social security and retirement funds. Now, with the passage of the Real ID act, the National ID card is outright law, and no longer just a defacto national ID number. Individuals wishing to travel in this country, whether it be driving themselves or riding on trains, busses, and airplanes will now be required to carry their national ID card, with their national ID number included on it. Even walking in public requires a person to carry their ID, as recent court decisions show. National ID cards are to carry "biometric data" probably in the form of a RFID chip, which can be read from a distance. Personal data about you will be available to any hacker on the street, in addition to being given to the Mexican and Canadian governments. National ID cards have long been a tool of tyrannical government. A government which abuses and therefore fears its populace needs to be able to track them at all times. No government who governs justly need barricade itself in, as Washington D.C. has done. A government who remains the servant of the people need not track the peoples' every move. To protest the injustice of the national ID number and national ID card, Russell Kanning, Kat Dillon and Lauren Canario of NHFree.com burned their social security cards in front of the social security administration in Concord, NH. A battered Lady Liberty made her appearance. National ID and the Patriot Act have given Ms. Liberty a rough few years. Signs at the event read, "Your number citizen, Welcome to the Machine," and "Social Security: The Big Lie. World's largest pyramid scheme. Ponzi would be proud." Signs were left for SS Admin employees to enjoy the next workday. Kanning left the event with the satisfaction of knowing that, "I finally said no to the government on issues of being numbered and being a part of the social security system." Young William G., age 4, who attended the event stated emphatically, "I don't want to be a number!" Social Security Card Burn, The Movie is now available, free! Burn them before the government burns the numbers into your skin as tattoos. Click here for examples of SS tattoos. 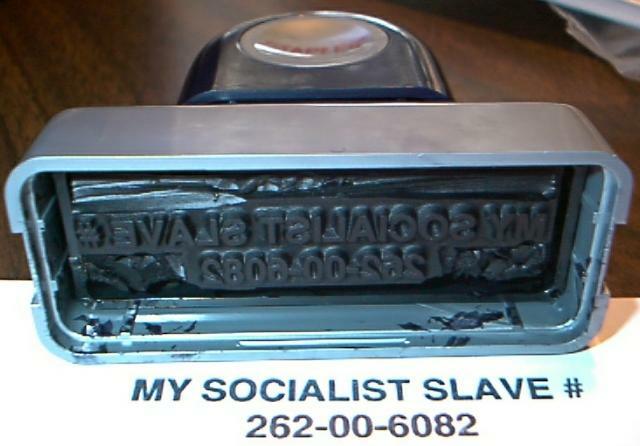 Wear your socialist slave number on your identification bracelet (handcuff) as intended under social security. RUBBER STAMP TATTOOS - use a rubber stamp to "tattoo" every slave at your burn party. 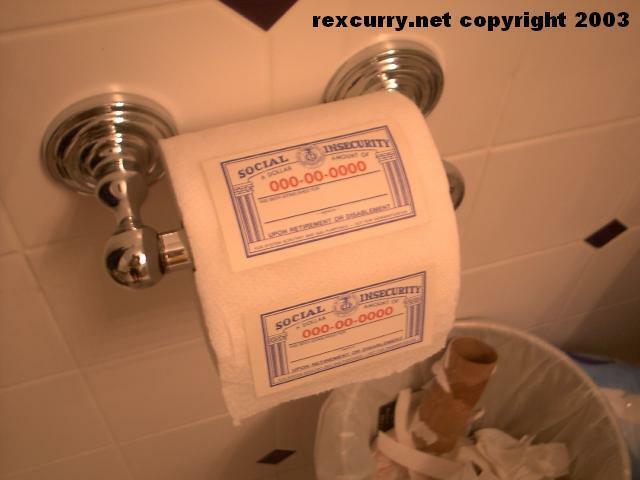 SOCIAL SECURITY TOILET PAPER - you've finally found a good use for your socialist slave card!!!! My Social Security number is 457-55-5462 says Todd Davis, CEO of LifeLock. 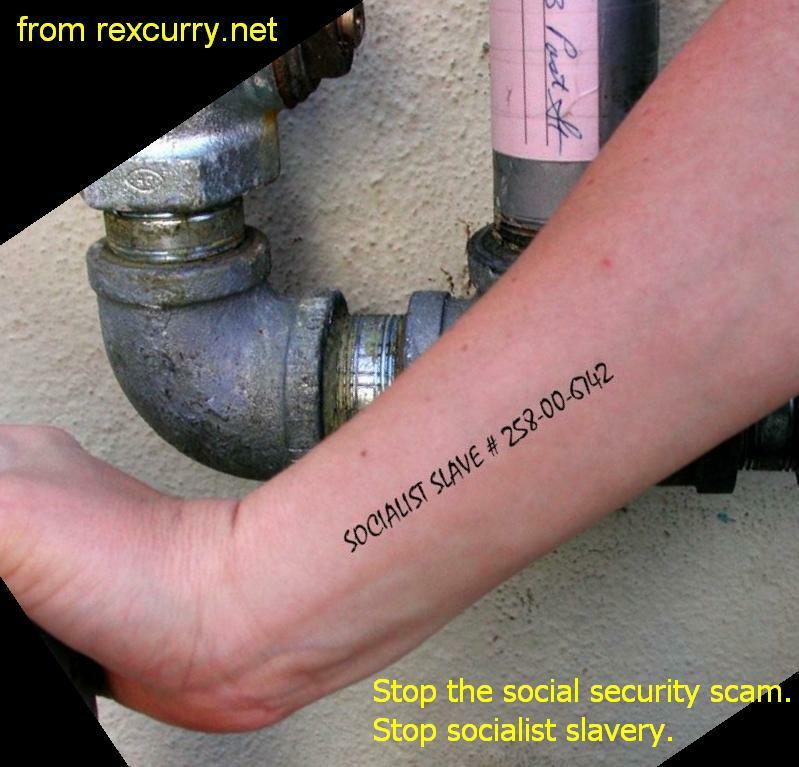 http://rexcurry.net/social-security-card-burns.html He says he's so sure he can stop identity theft, he has no hesitation about advertising his Social Security number. Identity theft via social security exists because social security card numbers exist. 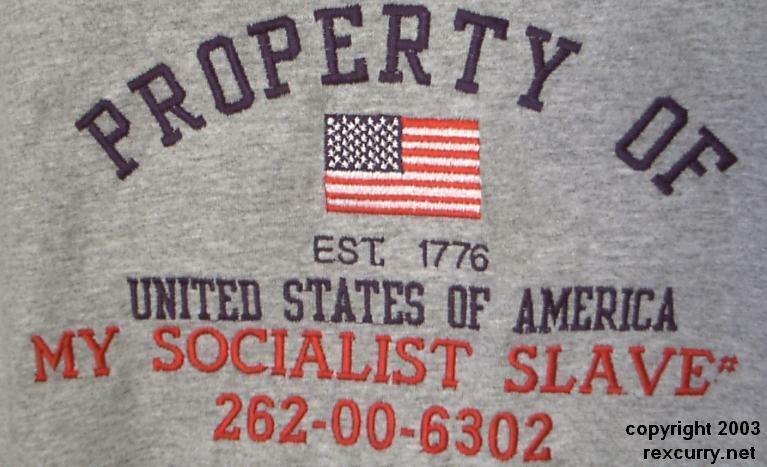 The USA's socialist slave numbers should be stopped because they endanger everyone's life and freedom. Another news outlet claims that a lawsuit alleges that "While LifeLock has only publicly acknowledged that Davis’ identity was compromised on one occasion, there are more than 20 driver’s licenses that have been fraudulently obtained [using his personal information]." According to the news report, the suit alleges that the Arizona-headquartered company does place and renew fraud alerts on its subscribers' credit profiles. Social security card numbers are part of the USA's growing police state in vast ways. The suit alleges that the protection offered does nothing to combat breaches involving personal bank, employment or medical information, as well as theft pertaining to government documents and benefits. "LifeLock knows, yet fails to disclose, that the services it provides do not offer the breadth of protection that it promotes through its massive advertising campaign," the suit alleges. In conclusion, the real problem is social security card numbers and the USA's police state and real Americans need to burn their social security cards (socialist slave cards). Todd Davis might just have well said "My socialist slave number is 457-55-5462.